We love sitting on the hotel terrace and taking in views of the fantastical rock formations of this beautiful region while eating a classic Turkish breakfast, including fresh Turkish pita, cheeses, yogurt, olives, and tomato and cucumber slices. Pure decadence: ordering delicious chocolate croissants, fresh bread, berries and French cheeses and enjoying the meal in a luxurious room in one of the best hotels in France, such as the Four Seasons George V.
Staying at a ryokan (traditional inn) is a cultural and culinary highlight of any trip to Japan. 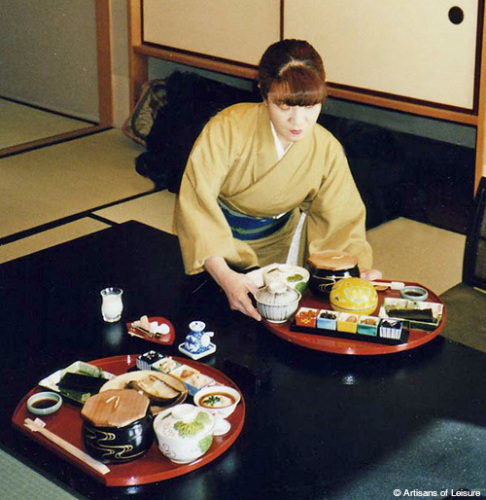 One of our favorite ryokan experiences is lingering over a traditional in-room Japanese breakfast of rice, nori, grilled fish, eggs, tofu, pickles and miso soup served on gorgeous ceramics and lacquerware. Before a busy day exploring London, we indulge in a proper English breakfast of strong tea, homemade baked beans, roast tomatoes, sausage, bacon, mushrooms, eggs and granary bread (as well as contemporary options such as fresh fruit smoothies, pastries, polenta with greens, and scrambled eggs with salmon), often while sitting in the breakfast room at the Mandarin Oriental Hyde Park and watching the Queen’s Royal Horse Guards trot by en route to Buckingham Palace. Breakfast buffets in Israel are elaborate affairs and filling enough to hold you over until dinnertime. Before starting touring for the day, we make time to enjoy the tables overflowing with sesame breads, baklava, halvah, hummus, olives, feta, yogurt, pickled vegetables, babka, stewed fruits, cakes and more. We love sitting at one of Florence’s famed cafes and enjoying local specialties, including frittatas, panini, and—we confess—even chocolate cake and coffee for breakfast. 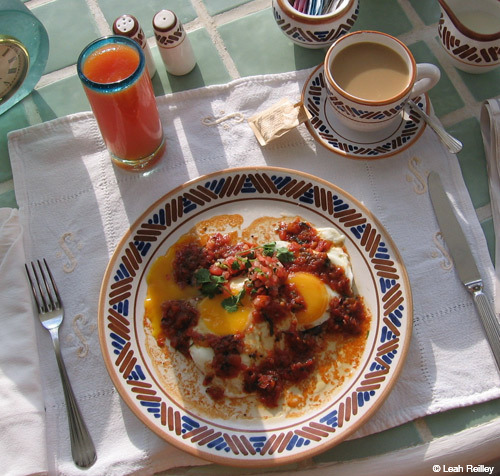 Whether we’re on the terrace at an upscale Mexican beach resort on the Riviera Maya or in the courtyard at the urban Four Seasons Hotel Mexico City, we like to order a glass of fresh-squeezed juice and a plate of huevos rancheros (corn tortillas, fried eggs, cheese and salsa). 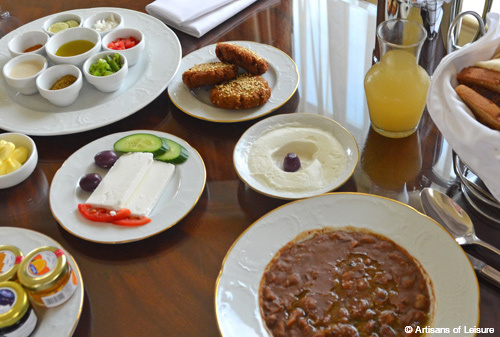 In Egypt, we recommend eating breakfast as the locals do: ful medames (stewed fava beans with olive oil, garlic, lemon juice and spices) accompanied by yogurt, cheese, falafel, stuffed bread, fruit and condiments. A historic cafe in Buenos Aires is our favorite place to savor medialunas—Argentina’s version of the croissant—with a side of dulce de leche and a cup of cafe con leche. There are endless delicious breakfast options in Bali, whether it’s banana pancakes at an expat cafe or more traditional fare, such as nasi goreng—an Indonesian breakfast of fried rice with chilies, shallots, garlic, chicken, sweet soy sauce, fried egg and other ingredients. 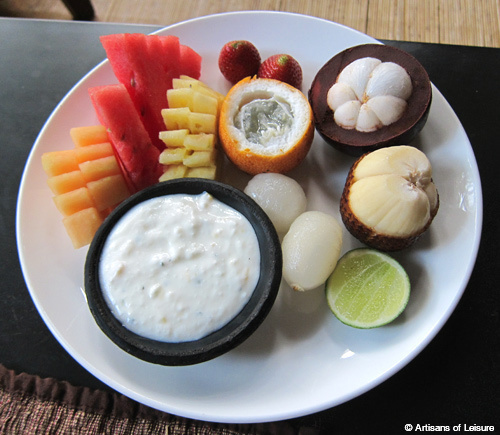 Or, keep it simple and enjoy the abundant fresh fruit (watermelon, pineapple, cantaloupe, strawberries, mangosteen, rambutan, passion fruit and salak, or snake fruit) with citrus mint yogurt and lime at a luxury resort overlooking the sea or terraced rice fields.